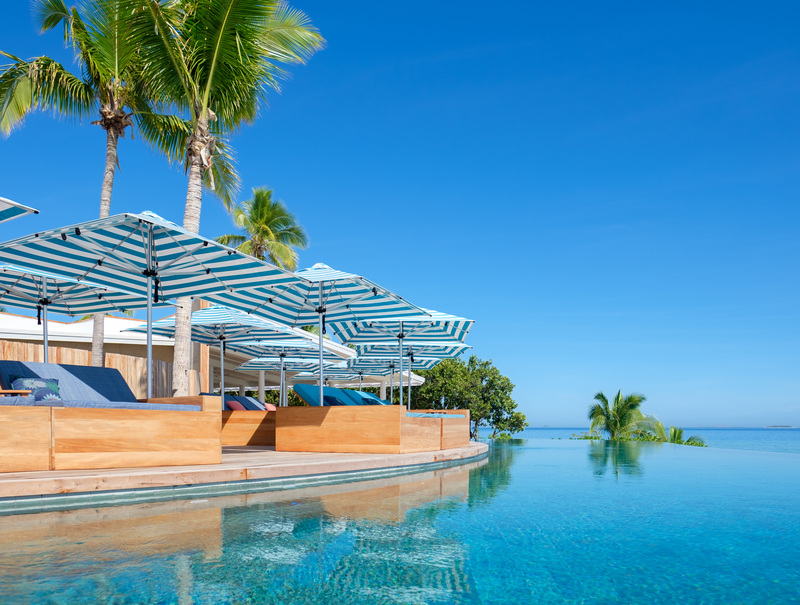 New Zealand company Shade7's outdoor umbrellas continue to be part of some innovative projects around the world, including the recent fit out of Malamala Beach Club in Fiji. Shade7 continues to leave its footprint across the globe with the addition of their outdoor umbrellas to the world’s first beach club situated on an island. Malamala Beach Club in Fiji is now home to 23 Monaco centre post umbrellas, which Shade7 designed and engineered themselves. Malamala Beach Club is situated on an island just 25 minutes from Port Denarau. With day pass access and a short cruise on a boat, guests can enjoy sandy white beaches, cabanas on the beach, an infinity edge pool and stunning views to the Mamanuca Islands. With resort style relaxation, food and cocktails, Malamala Beach Club is a luxurious day trip while on holiday in Fiji. New Zealand based interior design business Furnz Group contacted Shade7 to supply the outdoor umbrellas as part of this innovative project in Fiji. Furnz Group specialise in interior design solutions for hotels, serviced apartments, restaurants and bars. They were in charge of the décor for this brand new beach club. Shade7 supplied the Monaco outdoor umbrella as a commercial solution to the coastal environment the Beach Club is in. The Monaco was designed by Shade7 with marine grade quality and strength to handle commercial use and windy coastal environments. Furnz selected the 2.5m square Monacos in both a Blue/White stripe and Turquoise/White stripe for a modern look. The canopies are made with premium marine grade fabric with the highest colour fastness rating available, backed by a 5 year warranty against rot and colour fading. The fabric also has the highest sun protection rating of UPF80 to ensure the best sun protection. These high quality outdoor umbrellas are exactly what this island beach club needs for maximum longevity and strength. The Malamala Beach Club is officially open and ready for guests. Malamala Beach Club is certainly not the first Fijian resort to have Shade7’s outdoor umbrellaa. You will find Shade7’s outdoor umbrellas all throughout Fiji, including the Hilton Fiji Beach Resort. For any commercial enquiries please contact Shade7 in New Zealand.